Have you ever had someone who believed in you just enough to help you believe in yourself? I did. Her name is Amy, and I have just two words for her today. Thank You. Our website has been operational for several months now, our social media sites have been active as well, and with the official launch of Little Lamb Books complete via our launch party, it’s time to give a BIG, HUGE SHOUT OUT of THANKS to the main piece of our creative team! Amy, who owns and operates Two Leaf Creative, has been the ultimate creative designer behind the scenes, and I’m forever grateful for the amazing amount of work she has done to not only make us look great and have an online presence, but to breathe colorful, visual life into this very personal dream. Here’s what is so amazingly crazy about Amy and I working together. We went to high school together, a lifetime ago (Sorry Amy, but remember we count backwards now with birthdays!). We moved in different circles, she was on the drill team and I was in yearbook. Yet, we knew some of the same folks and had one or two of the same teachers. Of course, after graduation we went in different directions, and we didn’t see each other or stay in touch during almost…well, never mind the number, it was a lot of years folks! The incre dible thing about living in such a large metropolis is that it’s still a small world. Years passed, marriages took place, careers were created, babies were born, a couple of class reunions happened (Stop counting people, really! ), and the next thing you know Amy and I are re-introduced by a mutual friend (shout out to our friend and fellow NHS alum, Kerri, who takes wonderful pictures at Pixalillie Photography), who heard I was looking for a creative designer to contract with on the beginning of this project. 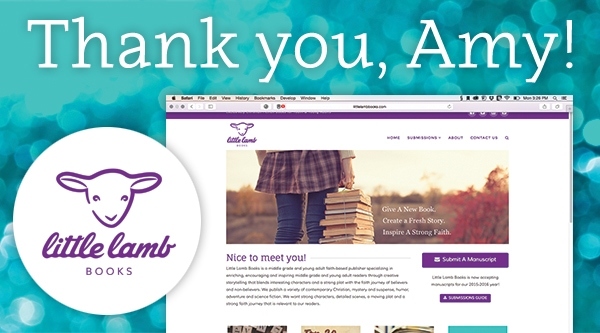 One contract, several design ideas, and many, many, many emails later, and Amy and I were on track as a team for the visual aspects of Little Lamb Books. I don’t always get it, but God has this great sense of humor and a mind-boggling sense of timing. All these amazing things had to line up just right, but HE knew who we needed to help us fulfill the vision of Little Lamb Books. It truly couldn’t have been completed by any one else, but Amy. She not only had a great visual eye and absolutely amazing artistic talent, she understood what it meant to me to be a Mom and work from a home office. So, I am beyond grateful and wanted share our thanks with all of you. I highly recommend Amy and her company, Two Leaf Creative. If you are looking for a creative and artistic graphic designer for a new website, company brochure, marketing art work, etc., reach out to Amy at www.twoleafcreative.com. And, hey Amy, THANK YOU! We heart you with lots and lots and lots of Lambie Love!